As the fifth full year of America's global war on terrorism continues, statistics concerning terrorist attacks show a disturbing trend: from a twenty-one-year high in 2003, attacks tripled in 2004 and then doubled in 2005. And as the incidence of terrorist attacks increased, so has the number of terrorists. Unfortunately, due to sales rights restrictions, we cannot offer Thinking Like A Terrorist for sale in your country. As the fifth full year of America’s global war on terrorism continues, statistics concerning terrorist attacks show a disturbing trend: from a twenty-one-year high in 2003, attacks tripled in 2004 and then doubled in 2005. And as the incidence of terrorist attacks increased, so has the number of terrorists. While the primary leaders of the Taliban, al Qaeda, and al Qaeda in Iraq remain at large, a 2006 Department of Defense study reportedly identified thirty new al Qaeda–affiliated terrorist groups that have been created since September 11, 2001. We may not have metrics that measure our success in the war on terrorism, but these realities certainly illuminate our failures. In Thinking Like a Terrorist, former FBI counterterrorism agent Mike German contends that the overarching problem is a fundamental failure to understand the terrorists—namely, what they want and how they intend to get it. When our counterterrorism policies are driven by misunderstanding and misperception, we shouldn’t be surprised at the results. Today’s terrorists have a real plan—a blueprint that has brought them victory in the past—that they are executing to perfection; moreover, their plan is published and available to anyone who bothers to read it. Once the terrorists’ plan is understood, we can develop and implement more effective counterterrorism strategies. A former undercover agent who infiltrated neo-Nazi terrorist groups in the United States, German explains the terrorist’s point of view and discusses ways to counter the terrorism threat. 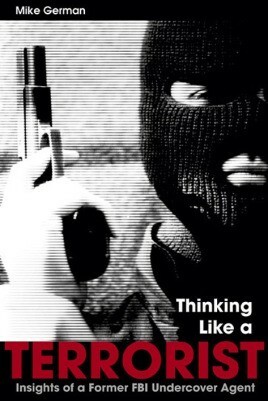 Based on his unusual experience in the field, Thinking Like a Terrorist provides unique insights into why terrorism is such a persistent and difficult problem and why the U.S. approach to counterterrorism isn’t working.